Jorge Gutiérrez, 27, was addressing a hall packed with almost 200 young people in Memphis, Tennessee. Like him, they were brought to the United States as children. Like him, they grew up as Americans. Although they were bilingual, English was their first language. Their parents came illegally, so they too, are undocumented. Then, he told them that he is not only undocumented, but also gay. He asked the pro-immigrant organizations represented there to be inclusive. If there were others who, like him, were undocumented and LGBT, he asked them to stand up and come down to the front. One by one, more than 20 activists stood up and approached. Some of them were revealing their sexual identity for the first time. Some were well known activists in the DREAMers movement. Gutiérrez, currently lives in Santa Ana, California. At the age of 10, he arrived illegally from El Cora, Nayarit, Mexico, with his mother, two brothers and two sisters. In 2008 he graduated from Cal State University – Fullerton with a BA in English. 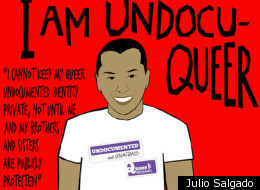 He is undocumented and queer, one of many. “Some of the most recognized leaders of the DREAMer movement, who never talked about it, are now out of the closet, and are calling on others to do the same,” he told The Huffington Post in a series of phone calls. Read the full story at Huffington Post’s Latino Voices.